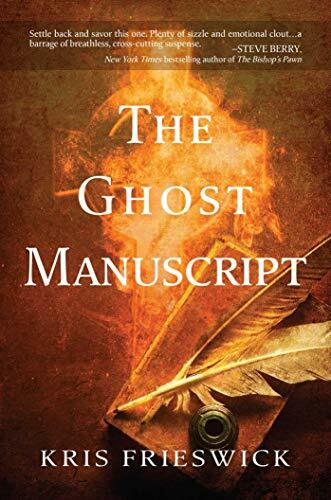 In The Ghost Manuscript Frieswick’s protagonist, Carys Jones, a rare book authenticator who works for an auction house on Boston, is hired by billionaire John Harper to review a rare manuscript dating back to the sixth century. Upon meeting with Harper, she discovers he has been placed in an asylum and is experiencing hallucinations, but he is clear enough in his direction to send her following the clues laid out in the manuscript to discover the gravesite of a king—in particular King Arthur. Enter the bad guy—Martin Gyles, an antiquities dealer of dubious reputation, who has been hired to follow Carys, find the manuscript, and dispose of it. The man who hired him remains in the shadows, unknown even to Gyles. Now aware of Carys’s task, Gyles desires the manuscript, its translation, and the treasure that is buried with the king for himself. Carys meets Nicola, Harper’s translator and the woman he loves, and she and Carys bond in their goal to find the king. Harper’s son, JJ, provides her with full access to Harper’s vast library to aid her in her pursuit. Enter Lestinus, a figment of her imagination or a true visitor from the other side? Regardless, he claims to be the monk who lived with King Arthur and wrote the original manuscript detailing the king’s burial spot. As Carys proceeds to read the manuscript, Lestinus becomes more of a factor in helping her find the king. Gyles, in the meantime, sets one of his thugs off to acquire the manuscript. Frank Marshfield, a no-holds-barred kind of thug, tries reasoning with her and when that does not work, he turns his attention to Nicola. A dreadful fight ensues, and she is mortally wounded. Carys finds her and the manuscript and takes her search to the next step. The clues, with help from Lestinus, lead her to Wales in search of the king. Here Frieswick details Carys’s personal background—her father, Anthony Jones, abandoned her mother when Carys was just a child, and moved back to his home in Wales. Her mother committed suicide, so Wales is not a big draw for Carys, but go she must. Once there, she communicates only with Annie, her best friend and a Boston lawyer. Although traveling on a false passport, she is soon located by Frank. She meets Dafydd, a local diver and a handsome one at that. Through his local connections, she visits a library and views historical maps dating back to King Arthur’s time—more clues to the king’s whereabouts. Annie’s mother, an old friend of Anthony’s, tells him of Carys’s journey to Wales and the danger she may be in, and Anthony sets out to find his estranged daughter. Anthony locates Carys, and much against her will a triumvirate is formed between Carys, Dafydd, and Anthony as they follow the myriad clues leading to King Arthur. Frank is also on the march, having found Carys. He follows the three as they find the burial site under water at the cliffside of Bardsey Island. The sarcophagus is empty of a body, but they find another manuscript. While Carys and Dafydd are diving, Frank takes over the boat Anthony is on, and waits. When they surface and discover Frank, Dafydd climbs onto the boat and kills Frank. Gyles is unable to contact Frank and sets another thug, Tommy, out to find and follow Carys. At the same time, Gyles is facing another crisis, as he is unable to meet the demands of one of his more nefarious clients. He decides that once King Arthur’s treasure is found, he must disappear from sight. As Carys begins to decipher the second manuscript, she finds herself forgiving her father for his abandonment and falling in love with Dafydd. And the new clues send her back to Boston and a new search for the king—clues that lead her to a local Indian tribe. Now reunited with Harper and Annie, the trail becomes hot, just as Tommy appears demanding the manuscript and location of the grave and the treasure. Here Frieswick brings the story down the road to its inevitable conclusion with a confrontation of biblical proportions. And the person who hired Gyles in the first place is uncovered. Frieswick writes a good story—a real page-turner. She perhaps spends a bit too much time on character background, employing several pages of background on Frank, Anthony, Gyles, and even Carys, when perhaps a paragraph or two would have filled the bill and been less distracting. Regardless, it’s a quick read with lots of plot twists and an exciting finish. Frieswick leaves several loose ends—Lestinus’s disappearance from the story is unexplained; the manuscripts are lost, but one is not sure if they are destroyed or stolen. It should be said however, that several of the loose ends leave the door open for another Carys Jones story in the making. One can only hope.